Most industry experts agree that they continue to see white shaker-style cabinets more than other choices, and that hardwood flooring in a variety of shades remains a popular kitchen floor. Beyond these findings, however, there are discrepancies about views of colors, appliances, and kitchen design itself. Regarding kitchen design, Louise Frost of The Design Studio reports she’s seeing a growing interest in kitchen layouts and taking cabinets to the ceiling to maximize storage and expand the space. “”Our clients are cutting down raised bars and extending countertops into the living space, often adding bar stools,” says Frost. Gail Adkins of Change Magic agrees that clients are interested in increased kitchen storage space. “And everyone seems to want to open their kitchen to the living space,” she says. 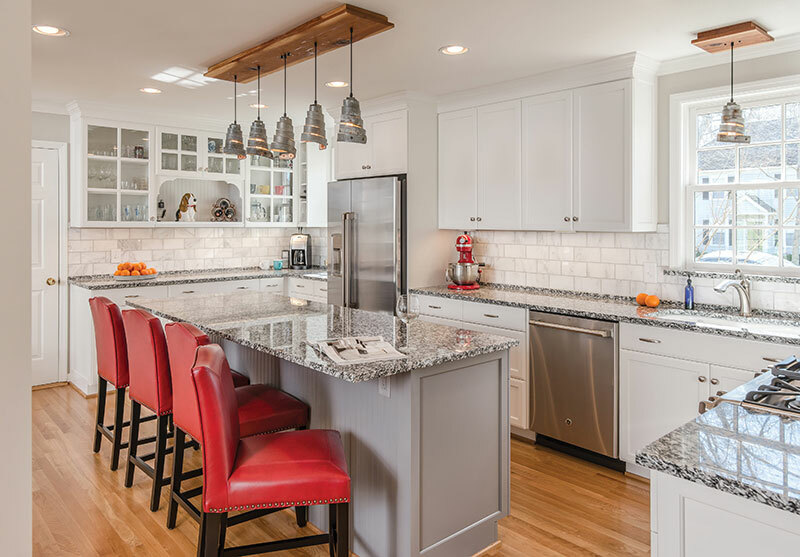 Open kitchens are embracing living space and are becoming larger, often taking in the formal dining room to enlarge the kitchen and providing a seating area in the kitchen—usually at the kitchen island,” says David Crane of Crane Builders LLC. Crane adds that he’s seeing lots of white and gray shaker style cabinets with different colored cabinets and different countertops on islands. He also has noted the growing interest in quartz countertops. Agreeing that open kitchens are with us for the foreseeable future is Sharon Hicks of Carriage House Custom Homes & Interiors. 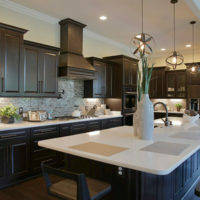 She also reports seeing white and gray cabinetry coupled with white, grey, and natural stone backsplashes. Taking cabinets to the ceiling helps utilize space, according to Zimmerle, and it makes the room look taller. “We’re also putting a lot of drawers and pullouts in bottom cabinets. No one wants to get on their hands and knees to locate items in the bottom cabinets. 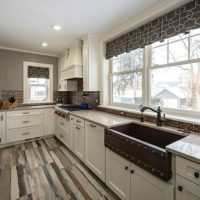 Echoing others, Ginny Bishop of Ginny Bishop Marketing says she is seeing white as the dominant color in cabinetry with backsplashes in neutrals and black and white. 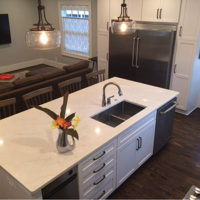 William Toungette of Ferguson Bath, Kitchen & Lighting Gallery reports he’s seeing white and gray cabinets in kitchens, but that dark grays and dark green colors are also showing up on cabinets and island as an accent color. Lighting for the kitchen is speaking to the new trends, Toungette says. “Illuminagles is the new lighting trend that describes fixtures that combine an open framework and vibrant light source to illuminate geometric shapes,” he adds. Melinda Calvert of Dream Kitchen and Bath says she’s seeing cabinets in white, stained gray, light and dark painted gray, shades of blue, and a painted off-white shade. “Backsplashes are often metallic finishes mixed with natural tones, as well as washed-out weathered look in white, gray, or beige. Wood and tile flooring materials are often espresso, blonde, honey, gray, whitewashed, and white, says Calvert. “Homeowners are seeking to bring natural elements back into their homes,” she says. 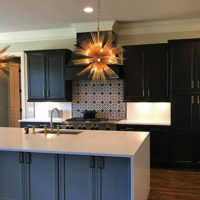 Builder Supply Source’s Eric Tudor reports he’s noticing a return to black and white kitchens—black and white cabinets, white tile backsplashes, and gold, matte black, and satin nickel hardware finishes. Emily Yoakum of Jonathan Miller Architects says the biggest kitchen trend noticed by her company is dedicated cabinetry stations. “Instead of all dishes in one cabinet and all appliances in another cabinet, we are seeing a trend of all items for making drinks in one cabinet and all items needed for baking in another cabinet. This allows the user to stay in one place instead of moving around the kitchen pulling different items from scattered placed to collect them in one spot,” says Yoakum. 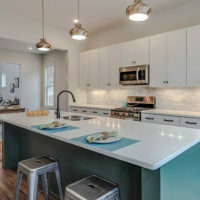 Contemporary kitchens generally feature frameless cabinets, full marble slab backsplashes, waterfall edges, cabinets without hardware, stacked rectangular tile, strip lighting accents, and linear oversized range hoods, says Schmunk. She adds that she’s seeing dark paint colors or dark stain colors in contemporary kitchens and bleached wood with light stain or painted cabinets in shades of white in transitional kitchens. Laura Bolen of OHM says she is seeing more stained cabinets becoming popular, although white is on trend. Bolen says her customers are asking for quartz countertops and natural stone in shades of blue. 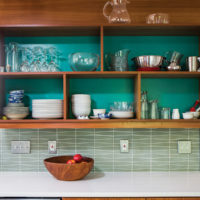 “I think beautiful wood—walnut, cherry, and exotics—are going to make a great resurgence for kitchen cabinets,” says Jennifer Jones of Jennifer Jones Design. Hermitage Lighting Gallery’s Carla Taylor says she is still seeing lots of shades of white in cabinetry. “The use of shades of gray and slowed down, as has the interest in navy,” she says. Recently one client chose a hexagon tile in a vivid blue for an entire wall as a backsplash—”It was stunning,” Taylor says. 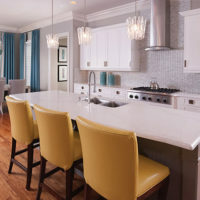 Reporting that homeowners are embracing color in their kitchens, from tile to cabinets and from flooring to appliances is Marcelle Guilbeau of Marcelle Guilbeau Interior Design. “Pops of bold color from red hot stoves to cobalt blue hexagon backsplash tiles are exotic, dramatic color choices that we’re seeing in all styles of homes,” she says. In cabinetry, Guilbeau is finding increased interest in medium wood tones for flooring and earthy tiles that ground the kitchen and contrast with brightly colored backsplashes and tile. “We’re also seeing soft blue grey incorporated in cabinets for a hint of color in the kitchen,” Guilbeau says. Debbie Hovspian of Crye-Leike says she’s seeing a trend toward large islands without sinks or cooktops. Streamlined kitchens are the trend according to Kate Fudim of Beth Haley Design. “Think flat front cabinets without hardware, hidden appliances and fewer—if any—upper cabinets. 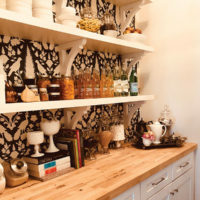 And floating shelves, that have been around for a while, are here to stay,” she says. 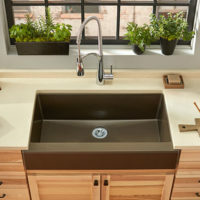 Justin Brady of Walnut Wood Works is also noticing an increased interest in floating and open shelves in the kitchen. 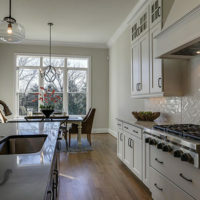 He also reports white and light neutral cabinetry and light blue backsplashes are popular among his customers. Today’s homeowners are seeking modern cabinetry, according to Jessica Johnson of Kole Custom Home Builders, and many favor a large working pantry to serve as a second kitchen. “We’re seeing the kitchen become a showplace while the prep kitchen in the pantry becomes the workhorse,” says Johnson. 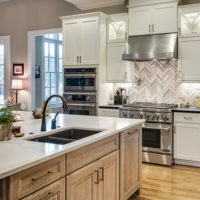 Erin Hurst of French’s Cabinet Gallery LLC says that white, light gray, and driftwood stained cabinetry are being paired with white, neutral gray, and taupe backsplashes. In larger homes, the trend is going back to two kitchens—the show kitchen is in the home’s main living area, and the auxiliary kitchen might be combined with a pantry/laundry room for a catering prep area. In agreement is Yoakum who reports seeing smaller kitchens that feel more intimate. “But the pantry is becoming larger and housing most of the equipment for cooking. This keeps the kitchen feeling clean and allows the cooking area to not be seen by friends and guests,” she says. Diane Chastain of Siano Appliances notes a contemporary trend in kitchens and a preponderance of stainless in kitchen hardware. The latest in appliances? Black stainless, she says. Fudim says many of her clients opt to hide appliances in remodels or new construction to create a more custom look. “Kitchen design in 2018 has seen a major shift in the way these spaces are being looked at and designed,” says Sebastian Bielski of Ultimate Finishes. “Kitchens are becoming more technology oriented and smarter. 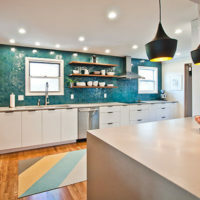 In addition, homeowners are choosing bolder color choices in their kitchens to showcase their personalities.” In that direction, he says backsplashes are utilizing patterns, finishes, textures, and color for an artful look.